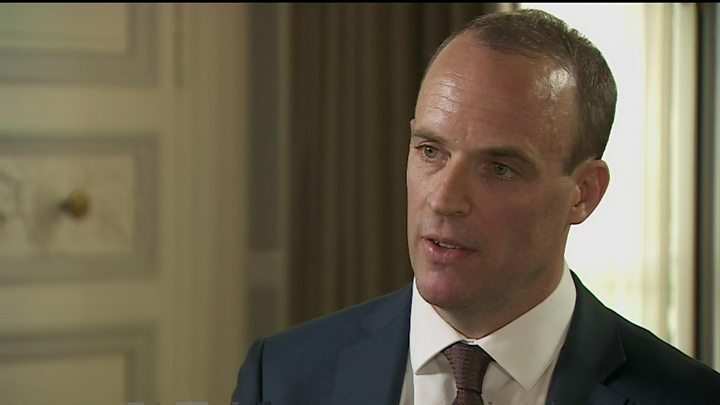 Brexit Secretary Dominic Raab has set out what he called “practical and proportionate” advice in case the UK leaves the EU without a deal. The guidance includes instructions for businesses who could face extra paperwork at borders and contingency plans to avoid medicine shortages. Britons visiting the EU could also face extra credit card charges. Ministers say a deal is the most likely outcome but that “short-term disruption” is possible without one. BBC political correspondent Chris Mason described the publication as a “vast swirling porridge of detail – much of it at a technical level, advising individual industries about the manner in which they are regulated in the event of a no-deal Brexit”. Mr Raab said reaching a deal with the EU was the “overriding priority” and “by far the most likely outcome” but that “we must be ready to consider the alternative”. He also dismissed what he said were “wilder claims” about the impact of not reaching a deal, including that it could spark a “sandwich famine” in the UK. “Let me assure you that, contrary to one of the wilder claims, you will still be able to enjoy a BLT after Brexit, and there are no plans to deploy the Army to maintain food supplies,” he said. Labour said a no-deal outcome would be “catastrophic” and a “complete failure by the government to negotiate for Britain”. The UK will cease to be a member of the EU on 29 March 2019. Pro-Brexit campaigners have described the warnings as “Project Fear” – saying the UK has nothing to fear from leaving without a trade deal and falling back on World Trade Organization rules. Conservative MP Jacob Rees-Mogg told the Today programme on BBC Radio 4 that such an arrangement “would suffice” and said the risks had been “absurdly overstated”. His fellow Brexiteer John Redwood said stockpiling six weeks worth of medical supplies was “a bit over the top” but that the government was being “ultra cautious”. The European Commission said Brexit would lead to disruption “with a deal or without a deal”. “That’s why everybody, and in particular economic operators, need to be prepared,” it said. The commission has already published its own assessment of no deal, saying there would be “no specific arrangement” for EU citizens living in the UK or for UK citizens in the EU and warning of “significant delays” at borders. For Labour, shadow Brexit secretary Keir Starmer said Mr Raab’s speech was “thin on detail, thin on substance and provided no answers to how ministers intend to mitigate the serious consequences of leaving the EU without an agreement”. Welsh First Minister Carwyn Jones said a no-deal Brexit would cause “huge disruption and serious, long-lasting economic and social damage”. The National Farmers’ Union warned of a “disastrous” cliff edge scenario for the UK food supply chain. Pointing to the possibility of new credit card charges, Lord Adonis of the People’s Vote campaign, said: “Every time a new Brexit paper is published, more people are made worse off”. TUC general secretary Frances O’Grady said the reports confirmed no-deal Brexit was not a credible option, as it would be “devastating for working people”.